2) Re-rolls often depend on the build you're using or want to use in the future. A very quick way to find out what stats are desired on an item is to use our build tool, put in the item in question, and look into builds that people have created using that item. Most build creators state the desired stats for every item in the build guide - take a look and you might find the answer there! 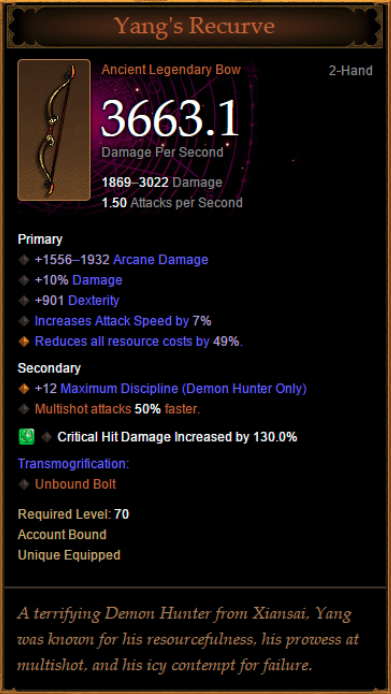 DiabloFans Demon Hunter builds => Enter the item's name under "Has Item" and hit "Filter"! 3) If you can't find the information there or resolve the case yourself, feel free to post in this thread. Note that the more information you provide the better; sometimes re-roll advice cannot be given without sufficient control. Best case just post your character profile and say what build you're aiming for and what's your favorite playstyle. 4) We will move re-roll question threads into this thread to keep everything in one place. That being said, if we feel this thread is abused for showing off, we might also move the post to the RNG thread. Please don't show off here and only ask sincere questions! I'm not entirely sure which one would churn out more damage. Moved to this thread, yuhanz. Not exactly re-roll help but strongly related and I'd figure it's better to have all those things in one place. What's the tooltip comparison if you remove the gem? My guess is the other one is better - you can still get 1% more IAS, you have 5% more RCR, higher damage roll... but I'm not sure about how important the 1 disc is. But my guess is that 11 or 12 doesn't make all the other benefits from the right hand bow irrelevant. 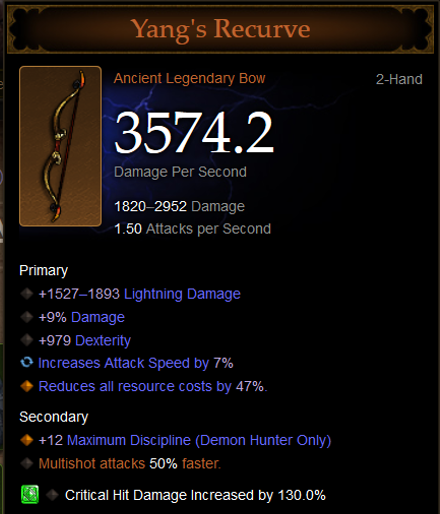 if i roll it to 5% as (so they are somewhat similar) , the new bow is +4~%. +5%~ right now. I really don't understand what you want, both bows area already rerolled so there's nothing you can do.. 1% ias isn't going to make the difference, but the RCR is. I'd go for the one on the right. 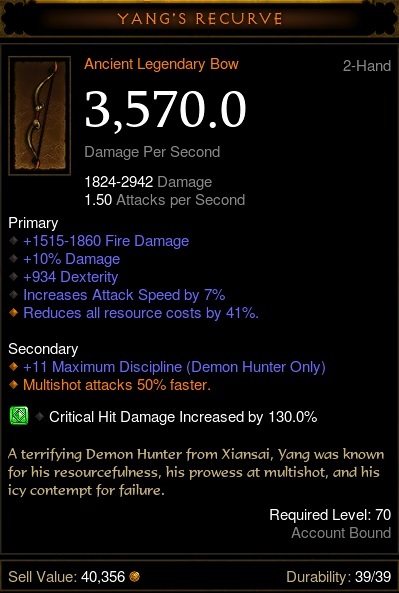 I've rolled a god-like Yangs Recuve (+10 Damage; 1000 Dex; +50 rcr; +12 Disc). It also rolled Vit which I originally rerolled to AS but have just now rerolled to +Elite Damage. I figured that since i don't have this multiplier on any of my other gear it was a better option. I also wondered about rcr; vit or Life on Hit, it almost seems like you can't go too far wrong with whatever stat I roll here..
Area Damage. Weapons roll to +24%. This is higher than anywhere else. If you are going to have it, you want it on your Weapon. But, you would need a GG one, but, you don't have that problem. Gratz (with about 25oz of salt do i wish you this gratz)....hate you so much right now lol. suggestion on what to roll? i dont think i would like to roll for the extra 1 disc? and i dont know how to put a pic of my bow here. im new ! 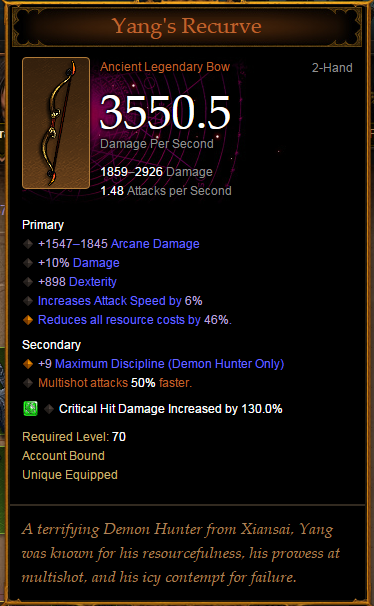 So today i was so lucky to find an ancient Yang's Recurve with _great_ stats. Now, i cant decide what stat to reroll..
or the 1% disc for 15% multishot damage? or the 9% resource cost which might give me more damage output over time? or there is the 66 dex? As you can see I currently rerolled it to +AS. But I am not sure about this. I could go for +10% increased dmg to elites. Or change to +area dmg. I already have rerolled 20% area dmg on shoulders. If I reroll should I just change the shoulders to +life or something? Very clearly you want to reroll the socket, to any number of possible stats. eg. +AS; +Elite Damage. Exactly what you choose to roll it to will depend partly on what stats you already have. It is just my opinion, but if you have no +Elite Damage on any of your other gear than that could be a good option. Of course +AS is never a bad thing. I've heard Area Damage is also a great option. Heck, if you are having survivability problems +1K Vit would not be bad either. The one I have. On normal though. Not playing DH this season. The bow he posted has the highest discipline roll it can have. Roll the socket to AS. I've read through several reroll topics and done a few simulations, but I think this is still a close call. Would you reroll the discipline to max or reroll the Vit to 10% elite damage? The discipline would give a little more than 3% multi dmg at all times and keep the Vit roll, wheres the elite damage could help clear rifts faster.Also rerolling Vit gives the flexibility of rerolling to other stats in the future. All input welcome, thanks!